Crestwood, Missouri, a suburb of St. Louis near where I live, has gone through some hard times. At one point Crestwood was the home of Crestwood Plaza, “where the big stores are”. Crestwood Plaza was such a popular shopping mall that one year, a week or two before Christmas, it took me over an hour to drive there in bumper-to-bumper traffic from only a few miles away, so many folk were eager to shop at the then very popular Crestwood Mall. Little by little, over the past decade, every one of the hundreds of stores in the indoor climate controlled retail paradise closed up, from the big anchor stores to the smaller chains. No one’s quite sure of the cause of this. One factor is the renovation of other malls in the St. Louis suburbs. Another is the declining demographic of Crestwood and its environs, an area which now consists mostly of seniors whose children and grandchildren live elsewhere. For a while, the mall’s owners were renting out abandoned shops to locals who were either struggling theater troupes or craft stores. The rent for each shuttered unit was a token of perhaps $100 per month, which is not enough to enable the mall to stay open and maintained, but a local arts mecca suddenly existed and the mall was being visited again. A development group has expressed interest in tearing the mall down and building a new and improved retail / entertainment paradise, but the group is being stymied by local politics and by a Crestwood board of aldermen who are not willing to authorize the hiring of a planner, and are wary of the tax increment financing the mall’s prospective developers are asking for. Recently, my family and I stepped out of St. Elizabeth of Hungary church in Crestwood to be greeted by a group distributing flyers regarding the situation at the mall. The group is Metropolitan Congregations United , an ecumenical association of Christians advocating for economic development in St. Louis neighborhoods. The flyer urges folks to attend the next Crestwood Board of Aldermen meeting to pressure city hall to give the developers what they want, so that the mall can be rebuilt and Crestwood’s tax base saved. So it occurred to me—are Christians really so gullible as to advocate for Salvation by Means of a Shopping Mall? If this new mall ever gets subsidized by TIF financing and built, who will the tenants be? Local craft shops and theater troupes? No, overpriced out-of-town chains selling useless luxury items. I understand that it’s not economically viable for locals to pay only $100 per month rent on indoor retail space, but is the solution to that the corporate capitalist cave-in to the least Christian element in our economy—the artificial and unnecessary air-conditioned affluence of chain store retail outlets? If Metropolitan Congregations United really wants to help the citizens of Crestwood, then they should learn a bit about Distributism and the social encyclicals of the Catholic Church. A more local economy, based upon a greater distribution of independent mom and pop business owners, would find a way to make the old mall viable, without surrendering to the “we always get what we want” mentality of our debt-based consumer culture. Tax Increment Financing is a fancy word for building or developing something and using sales taxes generated by expected revenue from that project to pay off the debt. I agree: probably there aren’t any qualified tenants left around. The chain stores that existed there for a long time probably drove the others out of business. I don’t know how or from whom such stores would come about again, which is something the article probably should have addressed. It’s unfortunate this was not really addressed by either of these sources, because I think we can agree it’s pretty integral to an understanding of how this is supposed to come about. Without knowing the full history of the mall, I submit that the mall owners have probably already tried to get any qualified tenant, whether local or national, to sign a lease for space. The owner leased to the craftsmen and non-profits because he couldn’t lure any better-paying tenants. 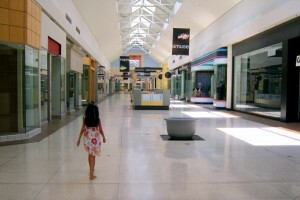 Without rent subsidies to local tenants, or a third party foundation or citizen investor group willing to financially support a mall filled with “mom and pop” stores, the mall will either be converted, as the local churches are advocating, or lie dormant. kind of tax break – is that what “tax increment financing” is? Well, if the aldermen did authorize tax breaks for a new mall, what’s to prevent the exact same thing from happening again in a few years? A newly renovated mall again sitting empty. Yes, our produce-junk-to-sell type of economy is increasingly unsustainable. It seems he’s advocating just the opposite. He says “A more local economy, based upon a greater distribution of independent mom and pop business owners” would make it viable, not the government. With a more robust local economy than just “theater troupes and craft stores,” presumably the necessarily higher rent could be paid. And if not, then I imagine the mall is not economically viable anyway and doesn’t deserve to be saved. Are you advocating government rent subsidies to local businesses that want to open a shop in the mall, to make the enterprise economically viable? Based on your article, it appears the former locally based tenants of the mall weren’t generating enough revenue to pay a higher monthly rent to the mall’s owners.